With all of the talk about the Zika virus and other mosquito borne diseases, you may think twice about installing a fountain or even using the fountain that is already in your yard. But you shouldn’t worry. Mosquitoes need shallow, stagnant water in order to breed. When you install most of our outdoor fountains, the water splashes enough to aerate the water and disrupt the mosquito’s breeding cycle. Some of my favorite outdoor fountains are the Henri Studios Aria Fountain (left) and the Henri Studios Mountreux 2-Tier Outdoor Floor Fountain (right). 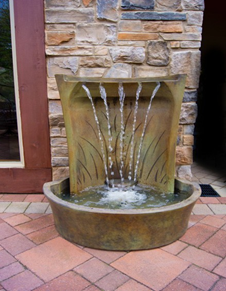 With these, and fountains with a similar design, you can see the jets of water cascading over the sides of the fountains and hear the soothing sounds of running water. 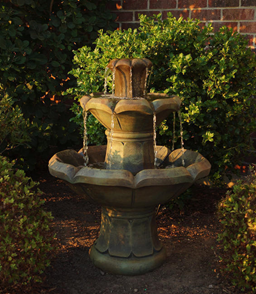 These attractive and relaxing features make owning an outdoor fountain very enjoyable. If the natural aeration isn’t enough to discourage the mosquitoes, there are additional steps you can take. Place a Bti dunk (Bacillus thuringiensis israelensis) dunk in your fountain. This natural bacterium will help ward off mosquitoes before they can breed in or near your fountain. Bti is an environmentally safe and effective larvicide used in a variety of consumer products. When shopping for a mosquito dunk, make sure it has Bti on the list of ingredients. It will only target mosquitoes and black flies, leaving the rest of your water ecosystem intact. Buy this mosquito dunk at your local hardware store or garden supply center to provide up to a month of protection. You can also try a horticultural spray oil. Mosquito larva breathe air through a little tube while they float on the surface, so "oil" remedies are designed to cut off their air supply. It only takes a few drops to form a microscopically thin sheen across the water. You can also try a few drops of mineral oil; it is completely non-toxic. Another method is putting additional chlorine in your fountain’s water. This will help control algae and the mosquitoes, but it may shorten the life of plastic or rubber plumbing, gaskets and the pump mechanism. If you do have mosquitoes in your yard, they probably aren’t coming from your fountain anyway. Make sure that you and your neighbors don’t have any standing water anywhere. Mosquitoes will breed in bird baths, old tires and any type of open container. With these tips, you can enjoy the serenity of watching and listening to your beautiful outdoor fountain without having to worry about mosquitoes.